Coinciding with Men’s Health Awareness Month, a UAE company, SPOTCHECK, launches a health & wellness eco-system that combines an 8-minute non-invasive health screening focusing on lifestyle diseases and a tailored wellness program through their web and mobile application. In the initial research 1,744 men participated between the age group of 18 and 71. The assessment focused on 30 health parameters. Results showed that out of 1,744 assessed, 24% were placed in the “careful or borderline” zone and 6% placed in the “warning” category. 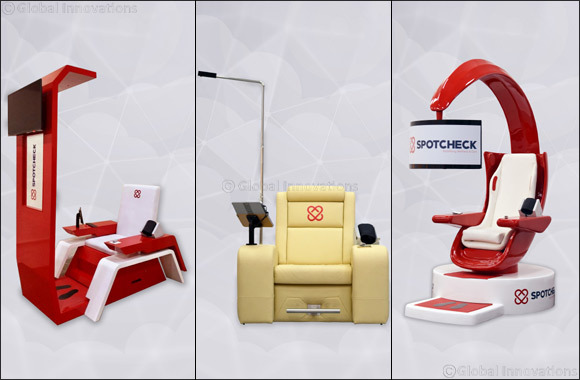 SPOTCHECK aims to reach consumers through corporate wellness, occupational health & safety and CSR initiatives. Dubai, UAE (November 21, 2018) - A UAE-based company has launched an innovative preventative health screening and wellness eco-system which is designed to detect lifestyle related health concerns at an early stage and provide a path to wellness using a recommended fitness and nutrition program. The SPOTCHECK eco-system incorporates a non-invasive health assessment kiosk and the digital platform ENHAPP, which provides the user with a personalized, condition specific wellness programs comprising of fitness routines, meal programs, engagement with lifestyle coaches and tele-consulting sessions. The kiosk uses FDA and CE approved health assessment technology and has won high acclaim and awards for its innovation within the medical technology arena. It is being introduced to corporate and government organizations that have a strong internal focus on employee wellbeing. The platform allows the employee to participate in corporate wellness challenges, connect with lifestyle coaches, peers and follow the path to wellness through the recommended programs. The journey of the user starts with a simple 8-minute health assessment where the user is comfortably seated. The kiosk uses the harmless Near-infrared Light Technology to assess 30 health parameters including stress analysis, fatigue index, hydration level, heart rate variability and vascular health analysis. Vascular Health (blood circulation) Analysis revealed that 15% were in the “careful” category. SPOTCHECK was co-founded by Dr Manoj Menon, who has over 27 years’ experience and expertise in strategic information technology planning with special emphasis on the healthcare sector. In his opinion, men will benefit massively from being screened in the workplace at least four times a year, and by following the recommended nutrition and exercise programs accessed via ENHAPP. Dr. Menon continues: “We are working closely with the Wellness and HR Managers of organizations to build a sustained wellness program for their employees. Considering an individual’s data privacy, the platform provides an aggregate corporate health analysis, highlighting top health concerns, hydration levels and other metrics which leads to the overall corporate health score. “Corporates see the obvious benefits in boosting the wellness of the employees and reducing cases of absenteeism and ill health, while employees are encouraged knowing that their employer is investing in their ongoing health regimes. Our technology team, along with in-house medical experts are continuously working towards improving the quality of the information and the user experience. Our aim is to be the leading wellness eco-system provider in this region and to gradually go global.